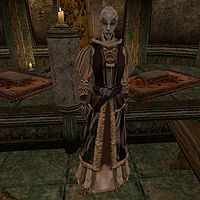 Councilor Salume Nethril is a Dunmer noble residing at the Nethril Plantation. She is the most senior of the Nethril family. She has a sister Silvenie and two nephews, Dithres and Halana. This page was last modified on 6 March 2019, at 08:47.